The Perfect Game Collegiate Baseball League has announced that Christian Santisteban (Elmira) and a quartet of pitchers have received the first Player and Pitcher of the Week awards of the 2015 season. Santisteban, who attends Manhattan College, hit .550 in the first week of the PGCBL season with 10 RBIs, tops in the league through the first week. Santsiteban had six RBIs on June 4 against Mohawk Valley, including a home run. His 10.35 Runs Created is tops on the league and his 1.490 OPS is in the league top 10. This year at Manhattan, Santisteban hit .301 in 50 games (49 starts) with 28 RBIs and two home runs. The Miami, Florida-native also spent the 2014 summer with Elmira. In 43 games, the PGCBL All-Star hit .299 with three home runs and 33 RBIs. In the first week of awards this year, four pitchers are sharing the honor of Pitcher of the Week. Michael Messier (Utica), Nick Cioffi (Albany), Chris Amorosi (Albany) and Anthony Romanelli (Amsterdam) all had strong starts during the week to lead their respective teams to strong starts to the campaign. In Utica’s 9-2 win over Victor on Sunday, Michael Messier tossed six scoreless innings, allowing just two hits and striking out four RailRiders to earn the win. Messier walked just one batter in the game. On Opening Night, Messier hurled 1.2 scoreless innings with three strikeouts in relief for the Brewers. At Bellarmine University this year, Messier earned three wins in 11 appearances. The Milton, Georgia-native had a 4.11 ERA on the year. On Opening Night, Albany starter Nick Cioffi tossed seven scoreless innings with eight strikeouts to lead the Dutchmen to a 2-1 win over the Elmira Pioneers. Cioffi allowed just three hits and walked just one batter in the start. The Averill Park, New York-native appeared in 14 games this year for Towson University, posting a 7.23 ERA. Cioffi wasn’t the only Albany starter to have a dominating start this week. 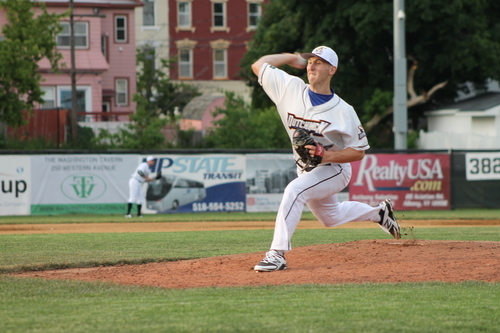 A night after Cioffi’s start, southpaw Chris Amorosi tossed 7.1 scoreless innings in a no-decision. Amorosi allowed four hits and struck out four Glens Falls Dragons. The Schenectady, New York-native appeared in 14 games this year for Siena College, winning three and posting a 3.51 ERA. The final pitcher to share the award is Anthony Romanelli, who had three separate appearances over the course of the week and struck out 11 batters total. On Opening Night in Glens Falls, Romanelli struck out two batters in an inning of work. Two nights later, the Wake Forest product struck out the side in a scoreless inning of work. Finally, on Saturday, Romanelli threw four scoreless innings, recording six strikeouts in the process. He allowed just one hit in the appearance. For all the latest news, scores and updates, follow the PGCBL on Twitter, @PGCBLbaseball.